Panel B contains the various modules that make up this unique physical string model and allow you to interact with its various parameters. Given the amount of praise that Lounge Lizard has already received for its accurate Fender Rhodes and Wurlitzer models from both artists and the press, you might expect AAS to rest on these laurels and move on to different projects (see SOS October 2002, for our original review of the instrument). However, the recently arrived Lounge Lizard EP3 sets itself even higher standards in the company's search for physically modelled perfection. At the heart of this third incarnation is the same physically modelled combination of a mallet hitting a fork (comprising a tine and tone bar), amplified by a magnetic pickup. However, EP3 has a new and improved Fork model, while the two pickup models now offer electromagnetic (Rhodes) and electrostatic (Wurlitzer) options for a much wider range of sounds, plus a keyboard scaling control, so that you can more easily balance levels at the bass and treble ends of the keyboard. The Damper module provides more refined modelling of the noise of the dampers being applied to or released from the fork. The dampers now interact with the Fork parameters, and there's also a new Balance control that alters whether you hear the damper noise in the attack portion of the instrument, in the release phase, or in a mixture of the two. 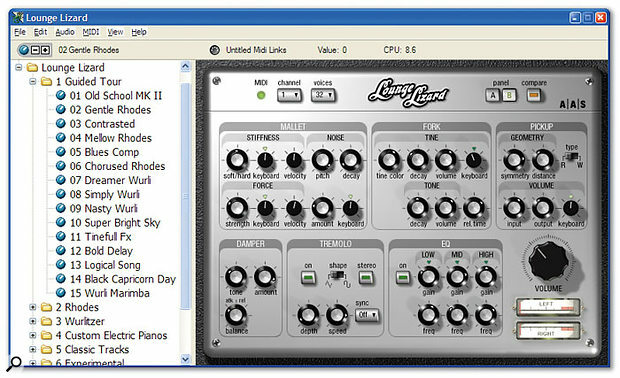 Finally, there's a completely new three-band semi-parametric EQ module to replace the more basic bass/treble controls of Lounge Lizard 2. Like AAS's String Studio, (see SOS August 2005) Lounge Lizard EP3 now has two switched front Panels (A and B) instead of one, which means that each one can be narrower, and AAS have taken advantage of this to add variable width to their preset Browser (just drag the divider between the two halves of the interface), so you can always read each preset name in full without horizontal scrolling (hooray!). The same reorganisation also results in the MIDI channel, polyphony, and activity controls moving to the main display from the Toolbar, so there's now enough space on the latter to display long preset names in full (hooray again!). Panel B houses the sound-generating components, and will be fairly recognisable to existing users. However, Panel A is completely new, and its contents are discussed in the box on the right. 'Chorused Rhodes': there's a lot of Rhodes presets on offer, including 'Mellow', 'Tinefull', 'Tineless', 'Old School', and 'Fully Serviced', but this is my favourite, for the delicacy of its tine sound and the 'bark' when you dig in. 'Chiff Bass': this offers a mellow mid range for chords, and rounded bass octaves with a 'chiffy' attack ideal for jazz workouts. 'Dreamer': this cutting sound captures the Wurlitzer from the famous Supertramp track perfectly. 'No Quarter': an atmospheric rendition of the watery phased piano from the classic Led Zeppelin track from Houses Of The Holy. 'Nasty Electro 2': electric pianos don't always need to offer tones of scintillating beauty, and this one can be mellow when played quietly, yet cut through almost any mix when required. 'Meditation Bells': with shimmering oriental overtones, this provides proof that the new Lounge Lizard engine can be pushed in more extreme directions. 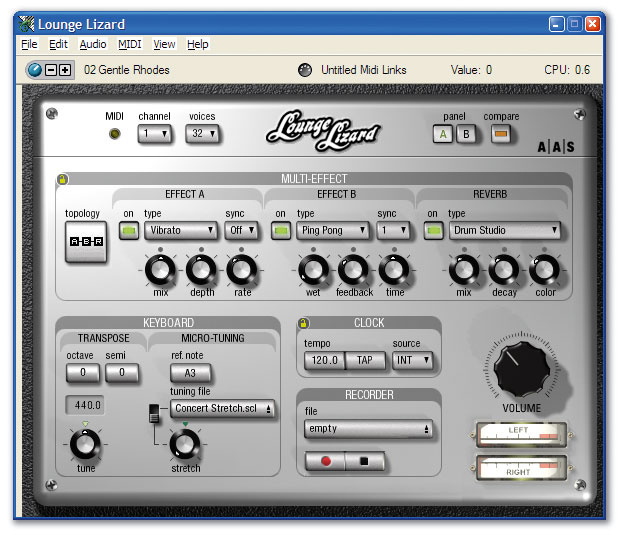 Lounge Lizard EP3 runs as a stand-alone application, and also supports VSTi, DXi, Audio Units and RTAS formats. I'm pleased to say that AAS have finally bowed to user demand and provided a 15-day grace period before you have to supply the response to the unique challenge generated after installation. This should go down well with all their users, especially those who have non-Internet-capable dual-boot setups and those who run into initial authorisation problems. AAS have learned the value of a set of 'Guided Tour' presets from their popular Ultra Analog and String Studio instruments in quickly showcasing the strengths of new products. 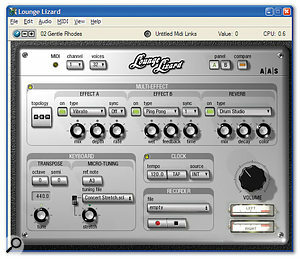 Lounge Lizard 2 was already an impressive beast, but from the first moment you play one of the presets in the new version you can hear the engine improvements — there's a greater transparency of sound in the upper harmonics thanks to the new Fork model, while the greatly enhanced effects section adds further polish to each instrument. CPU overhead is also surprisingly modest for a physically modelled instrument, and even my elderly 2.8GHz Pentium 4 Northwood processor managed to produce the maximum 32 notes of polyphony with CPU usage peaks of just 30 percent — some sampled electric pianos consume this without offering any of the subtlety and expression of Lounge Lizard. I did miss the pitch-tracking of the mallet noise (which I've used in the past to create tuned percussion, organs, and vibes), although there's no denying that for more realistic electric pianos the mallet noise pitch shouldn't change across the keyboard — hopefully AAS will provide a tracking on/off switch in a future update for those of us who like to derail the engine in search of exotica. The only other downside to the new engine is that because of its modifications and enhancements it can only import instruments in its own LX3 format, and not those from previous versions of Lounge Lizard. However, those who rely on existing instruments from the older version of the program can simply leave that installed alongside with no conflicts (as there are no samples in Lounge Lizard, the install size is only around 12MB). 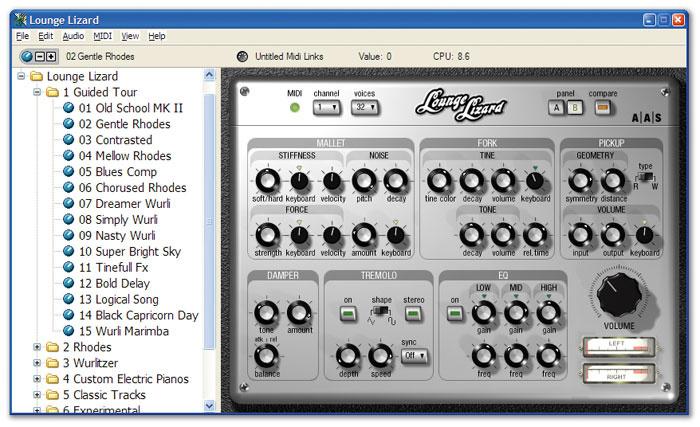 As in previous versions, MIDI Links let you automate any combination of panel controls in real time using an external controller, but in EP3 there's a folder of supplied examples that provide insight into what's possible, since apart from obvious links such as mod-wheel control of Tremolo and other effects, there are also various pickup-related links that control pickup symmetry, distance, and output level simultaneously in varying amounts and relative directions. These provide lots of performance options, and surprisingly, there's no 'zipper' noise except when changing the effects mix controls. Panel A contains a host of more traditional controls to fine-tune your sounds, including multi-effects. While the Tremolo section from Lounge Lizard 2 remains unchanged on Panel B, its Wah and Phaser modules have now been incorporated into a much more flexible multi-effects section on Panel A comprising three modules. The first two are identical, offering a mono and stereo chorus and a flanger, plus other effects like vibrato, ping-pong, digital and tape delays, a phaser, auto and standard wah, a notch filter, and distortion, while the third is a versatile reverb with nine algorithms ranging from small rooms to large halls. The reverb is always the final effect in the chain, but the other two modules can have their order swapped or be run in parallel, offering you some versatile new possibilities such as having simultaneous clean and distorted sounds, or complex multiple chorus or flanging effects. The Rate controls can either be set to manual or sync'ed to a VST host application, or to the new Clock module, which features manual or tap-tempo adjustment. There's even a tiny Padlock icon at top left of the entire multi-effects section to lock the effects settings, even when you're changing presets. Overall, the multi-effects are the icing on the cake, offering sophistication and flexibility. Band members will be pleased to find a new keyboard module with global tuning and transpose functions, and there's even support for different tuning temperaments by loading in Scala-format micro-tuning files. One 'Concert Stretch' file is included (and you can download 3000 more from www.xs4all.nl/~huygensf/scala), or you can switch back to equal temperament and use the new Stretch control to manually create your own octave interval either side of the chosen reference note, from narrower to wider with a neutral position in the middle. Keyboard tuning module settings are independent of presets, though, and there are no reset or default settings (even between sessions), so take care. Finally, there's a new Recorder module to capture your performances, plus various smaller improvements such as stereo instead of mono output-level meters. When the original Lounge Lizard came out, it was regarded as extremely clever, not to say handy if you didn't have a real electric piano to hand. By version 2 the heavy processor overhead had plummeted and the sound had become more refined, and various big-name players were beginning to regard it as more convenient, even if they did have the 'real thing' as well. With Lounge Lizard EP3, I predict that many musicians may well desire it more than the acoustic instruments it models — it just feels so good to play, you forget within a few seconds that you're not playing a real acoustic instrument, and there are hundreds of variations and refinements available that don't involve a technician manhandling 73 tines and pickups! Lounge Lizard EP3 is quite simply the new benchmark against which all electric piano sounds must be judged. Offers some of the most transparent and realistic virtual electric piano sounds available. Low CPU overhead considering the sophistication on offer. Excellent value for money (particularly for existing Lounge Lizard users). Sounds from Lounge Lizard 2 can't be imported into the new version. If you like electric piano sounds and have a computer, you have to buy Lounge Lizard — it's as simple as that! £149.99 including VAT; upgrade from version 2, $49 (on-line download only).